Samsung's Galaxy S II Has The Fastest Smartphone GPU! The results are in and the Mali-400 GPU found in Samsung's Galaxy S 2 has been found to be the fastest in any smartphone. 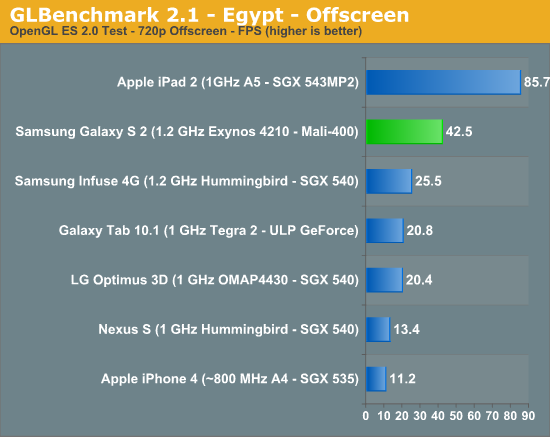 Although it is still some way behind the iPad 2's PowerVR SGX 543MP2, the results in the graph below speak for themselves. Samsung use their own Exynos 4210 SoC (System on Chip) which is built up of 2 Cortex A9 chips and a quad-core (yes 4 cores) variation of ARM's Mali-400 GPU. It produced almost twice as many FPS (Frames-Per-Second) as the closest smartphone according to tests done by AnandTech using GLBenchmark 2.1. It even beats (pretty badly) the Galaxy Tab 10.1 with it's Tegra 2 processor, although the results of the Tab 10.1 may be understandable as the higher resolution and screen size will affect the speed of the device.